Produced in our workshop , these basket shaped traps are made of resistant Polyetilene mesh net and steel wire frames designed for butterflies using rotten fruit as bait . As we all know butterflies take flight straight up not by sides, this way ,once they come to feed and get scared by other insects coming or just when they finish to eat, flying away, they leave straight up going inside the cone located just above the dish ( provided of a 10cm diam. hole ) and they cannot get down, they definitely finish inside the mesh trap. 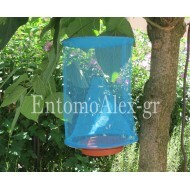 Similar to the fuit trap for butterflies but much smaller these meshed basket shaped traps have smaller size , about 25x30cm they consist in a trap for catching alive flyes and Drosophila for feeding our Mantis or other predator beetles. 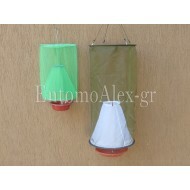 HANGING MESH TRAPS There are 2 products. SIZE: 24x35cm BAIT DISH: 16cm diam. 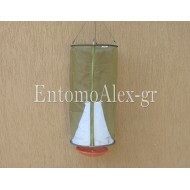 SIZE: 24x35cm BAIT DISH: 16cm diam.